Shertech self-priming, positive displacement, external gear, hot oil pumps feature cast-iron construction, with Viton mechanical seal for high temperature use. This series of non-clogging pumps are highly recommended for high flow waste oil rendering because they are able to pass small non-abrasive particles and reduce oil shear. 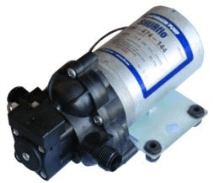 Features include heavy-duty stainless steel helical non-corrosive gears for quiet and long-life pumping action, carbon graphite bushings and ball bearing drive for continuous use, with a stainless steel adjustable pressure relief valve as standard equipment. This series of pumps can also be used for hot oil or frying oil filtration up to 375° F., meeting NSF-listing requirements. Pumps are configured with motors specifically for hot oil applications where oil is heated prior to pumping and discharge pressure limitations do not exceed 50 PSI with supplied motors. They provide a nearly pulseless flow in applications where small or non-particulate and nonabrasive fluids are pumped. AC ODP single-phase motors have thermal overload protection. 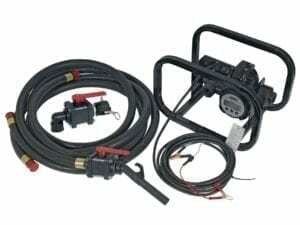 Complete package is easy to install, or optional pump heads only can be purchased for custom installations. Uses: Ideal for a wide range of commercial fat fryer hot oil cooking, filtering, or waste oil rendering applications. This pump can also be used in non-NSF hot oil applications with non-particulate and non-abrasive fluids compatible with pump wet-end construction component materials. Not for use with water-based fluids. • Pumps meet NSF-listed standards including NSF-accepted paint for hot oil cooking applications. • Pumps can operate bi-directionally (reverse operation should be used intermittently). • Pressures to 125 PSI with pump heads. • Pressures to 50 PSI, maximum viscosity of 100 SSU and maximum specific gravity of 1.1 with configured motors. • Flows to 10.8 GPM. • Operating temperatures to 375° F. • Maximum viscosity of 1000 SSU and maximum specific gravity of 1.1 with pump heads and optional motors at 1725 RPM, and viscosities up to 100,000 SSU at reduced motor speeds. • Suction lift capabilities up to 12.3 feet of head. • Maximum RPM: 1725. 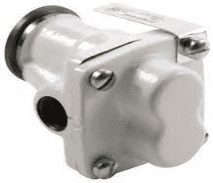 • Stainless steel adjustable pressure relief valve standard. • Port size: 1/2″ and/or 3/4″. 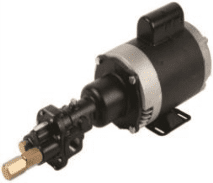 • ODP single-phase 56C frame motors with 1/2 or 3/4 HP with thermal overload protection. • 416 SS helical gear set for handling high viscosity fluids and low oil shear. • 303 SS drive shaft and idler shaft with carbon graphite bushings and a ball bearing drive. • Seal flush ports for handling fluids of viscosities greater than 2000 SSU. • Maximum case pressure of 200 PSI. Wet-end parts are constructed from cast iron, steel, stainless steel (303, 17-7, 18-8, 416, 15-7MO), carbon, graphite, ceramic, and Viton.